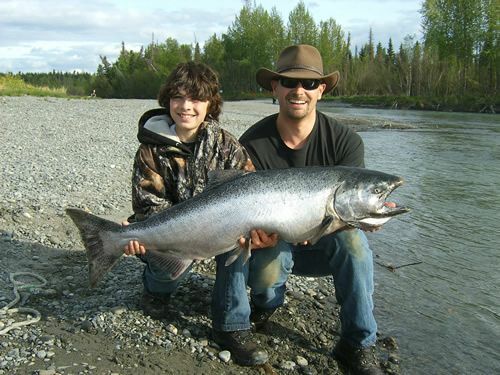 The Kasilof River, a river similar in color and flow as the Kenai, yet smaller, is located just south of Soldotna and offers a variety of shore and drift boat salmon fishing opportunities for both guided & unguided anglers. 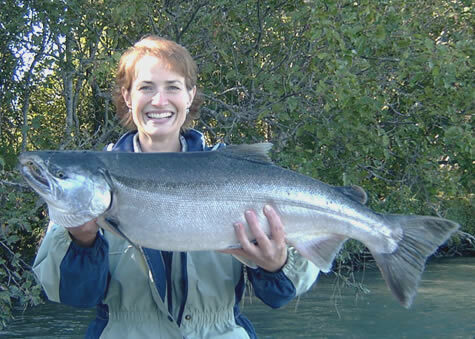 King Salmon, Red Salmon, Silver Salmon, Rainbow Trout, Dolly Varden, and even a few Steelhead can be found in the Kasilof. 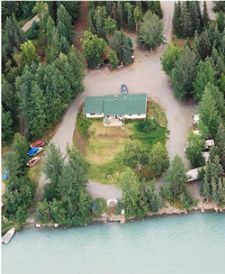 The most popular public access fishing area is Crooked Creek State Recreation Site, where the clear water of Crooked Creek flows into the glacial melt water of the Kasilof. Access is off Coho Loop Road, which is a few miles past the Kasilof River bridge on the Sterling Hwy. Turn on Coho Loop Road and watch for the signs on your right after a couple miles. While this area can be crowded on weekends and during the run peaks, it does offer some excellent shore fishing for King Salmon, and I landed my first King here on my fourth cast in 1984 myself. Fishing is done typically with one of two techniques; either salmon roe behind spin-n-glos or cheaters drifting near the bottom, or fly rod fishing with yarn streamers in chartreuse or orange. 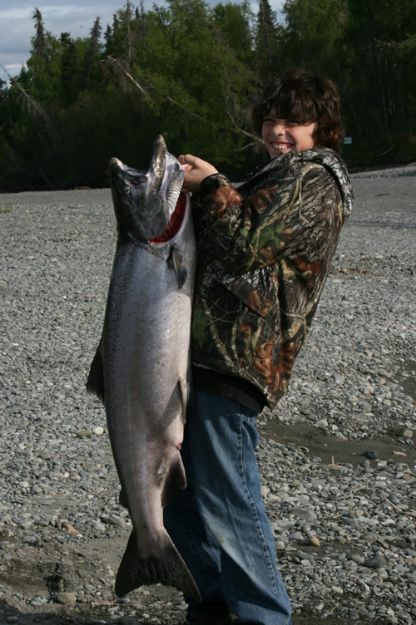 Please note that this river has a mix of both hatchery released and wild King Salmon. Hatchery released fish can be retained any day of the week, and can be identified by their missing adipose fin. Wild fish can ONLY be retained on Tuesdays, Thursdays, and Saturdays. Always check Fish & Game fishing regulations first. The source of the Kasilof River is Lake Tustumena, the largest lake on the entire Kenai Peninsula and one of the largest in Alaska. Near the headwaters is another State Recreation Site with modestly improved campsites, outhouses, and bank fishing for salmon and trout (including Lake Trout which occassionally meander downstream to this point). 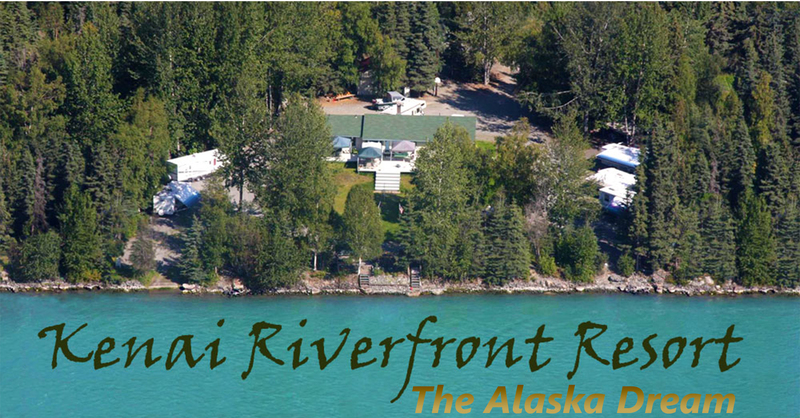 There is a boat launch at this site as well, providing launch access for drift boats going downstream and power boats heading upstream to the lake. This lake is particularly dangerous in high wind conditions, so mind the weather. You can drift the Kasilof on a full day guided King Salmon fishing trip for $175~$250 per person depending on the size of your group and the time of the run. Submit a Reservation Request or call us today for assistance!